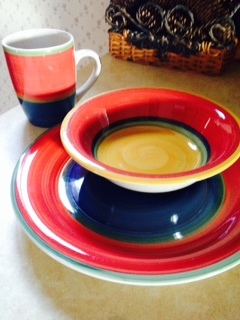 I stepped out of the box and splurged on a new set of dishes from the Dollar Tree. The brand though is Royal Norfolk which I’m really surprised because I think that is a pretty good quality dish? Eh maybe I’m wrong and I want to believe I got a steal but whatever anyway. I love them and they are different then anything I would buy. Out with the old in with the new. I seriously have no business being on here. I’m behind on my schoolwork and I skipped interning today. Arrghh my bad. It was just one of those days. I went for my regular checkup and the good news was I am off my BP medicine for the time being well until he checks it next week to make sure my BP stays down and I lost 15 lbs since September. Wooo hooo! The bad news is I have two cyst on my wrist which is causing my arm to go numb and the other bad news is I don’t have health insurance to have them removed. Oh well. I don’t think I’m alone on that one. Anyway that’s it for now. I have to get going on my chores blah.